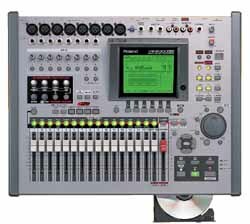 The VS-2000CD Digital Studio Workstation sets a new standard for affordable digital recording. With 20 tracks, 8 XLR inputs and support for 3rd party plug-ins using the optional VS8F-3. Add the optional VS20-VGA with Version 2.0 software, and you can run your sessions with mouse and monitor for maximum control. A 40GB hard drive, CD-RW drive and USB 2.0 port come standard. 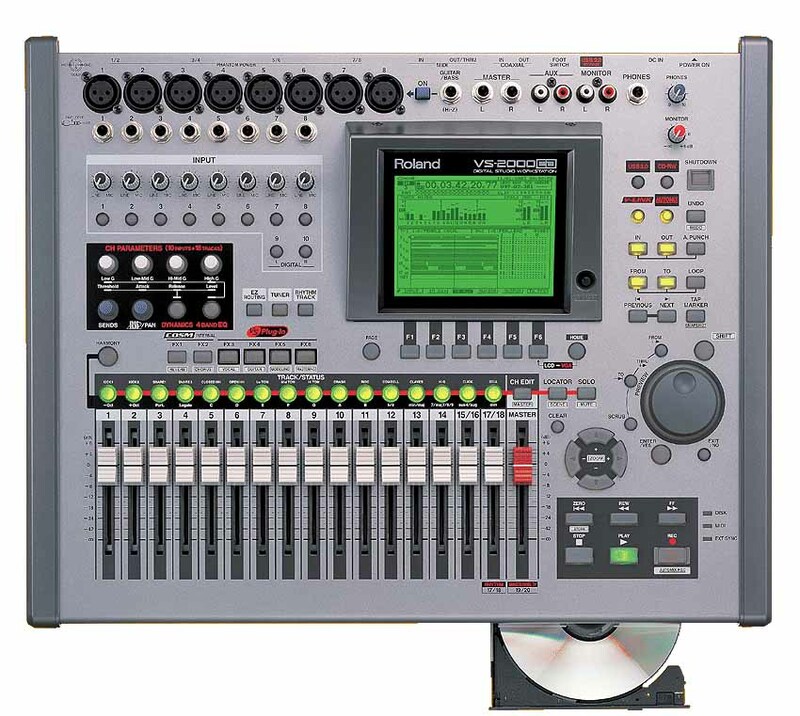 The VS-2000CD offers CD-quality recording at a choice of 16 or 24 bits. With the high-quality 24-bit mode you get up to 8-track simultaneous recording and 12-track playback. An internal 40GB hard drive provides hours of reliable multitrack recording, while 320 Virtual Tracks give you all the room you need. Eight XLR/TRS inputs with phantom power. Theres a Hi-Z input (guitar) as well, plus a S/PDIF digital input. The VS-2000CDs 40-channel digital mixer has 17 faders and dedicated Channel Edit knobs. In addition, there are four knobs for controlling the dynamics and 4-band EQ for any input or track. The VS-2000CD comes with onboard effects that include essentials like reverb, delay and chorus, plus dynamics processors, EQ and more. You also get access to Rolands COSM effects like guitar amp and mic modeling. When youre ready master, select the Mastering Tool Kit with multi-band compression and burn a CD via the internal CD-RW drive. By installing an optional VS8F-3 Effect Expansion Board (the VS-2000CD has room for two), you can bring plug-ins of 3rd party developers (including Antares, IK Multimedia, Massenburg and Universal Audio) to your V-Studio. Every VS8F-3 includes a selection of high-quality Roland plug-ins to get you started. The VS-2000CD comes with several new tools designed to help you make better recordings. Using the new Harmony Sequence function, vocalists can add instant harmonies to their performance. You can even program drums on Tracks 17-18 using the new Rhythm Track feature. Lots of preset drum sounds included. A handy chromatic tuner is also included so guitarists can tune up before recording. By adding the optional VS20-VGA Output Board (with Version 2.0 software), users gain full mouse and monitor suppor . Simply connect your VGA monitor and mouse, and you can perform drag-and-drop editing and mix your tracks using a sleek software interface. With USB 2.0, you can transfer data between the VS-2000CD and a computer quickly and easily. This new generation of USB offers more than twice the bandwidth of the previous USB standard, making it faster than ever to load audio to and from your V-Studio. Using the bundled conversion software for Mac and PC, you can transfer V-Studio files to your computer desktop, where they can be converted to .WAV or AIFF format. Or simply use the built-in CD-RW drive to load and convert .WAV/AIFF files, or convert V-Studio files to .WAV format for export. With V-LINK technology, you can easily integrate video material with your music. Connect an optional Edirol video editor, and you can trigger clips or create effects like transitions and dissolves using the VS-2000CDs faders.